Humboldt penguins, which live mostly along the coasts of Chile and Peru, share some interesting characteristics with other penguin species. For example, they can drink saltwater thanks to a special gland that filters salt out of their systems. Also, their coloring -- black on the back and white on their bellies -- helps camouflage them in the water, with their backs blending in with the water from above and their tummies mixing with the sunlight from below. However, there are a few things that make Humboldts special. Humboldt penguins are named after German scientist and explorer Alexander von Humboldt, who traveled through Central and South America from 1799 to 1804. Among his discoveries was an ocean current that runs along South America's west coast beside Peru and Chile. The current was dubbed the Humboldt current, and the penguins that lived along the current's line share the same name. 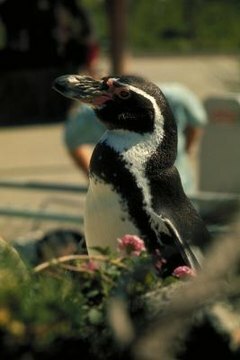 Although Humboldt penguins don't migrate as a matter of course, they are capable of traveling great distances. They can travel up to 47 miles a day in search of food, usually when they are trying to feed their chicks. Sporting the typical penguin black-and-white coloring, Humboldt penguins add another shade to the mix: pink. The pink patches found around their faces, under their wings and on their feet are featherless spots designed to help their bodies release heat. When they get hot, their blood rushes to these bare spots to let their body heat escape and cool them off, making them look like they're blushing. These penguins sometimes create nests in rock crevices, but they prefer to dig circular indentations in dried guano, which is leftover poop from other penguins and seagulls. Males do the digging, then line the nests with smooth rocks and grasses. The females lay their eggs in the guano nests, then both parents share egg-sitting duties for more than a month until the chicks hatch. Humboldt penguins are suffering from declining population numbers, due in part to human interference in their environment. Guano is an excellent fertilizer, so humans harvest it and reduce the size of Humboldt penguin breeding grounds. They also fish in the same waters, reducing the penguin's food supply and catching some in fishing nets. The governments of Chile and Peru have established some guidelines to help reduce humans' threat to the penguins. Weather is also a factor, with El Nino events reducing the penguin's food supply even further by warming surface waters and dispersing many of the fish normally eaten by the penguins. The resulting lack of food causes a fast drop in penguin populations during El Nino seasons -- a 65 percent drop in the 1982-83 El Nino event, according to Sea World. Humboldt penguins are vulnerable to many predators as well, including seals, sharks, foxes and snakes. Why Do Penguins Smell Bad?